The tension between state control over resources and local communities' demands for 'sovereignty'. The tug of war between the centre and the regional governments has dominated the debate about regional autonomy in the media, in parliament and among Indonesia's creditors. Soon after taking office, President Wahid pledged his commitment to foreign companies and declared his new government investor-friendly. The response to regional autonomy by Indonesia's main creditors has been mixed. While they officially acknowledge the need for decentralisation and greater decision-making powers at regional level they also express doubts about the capacity of Indonesia to implement regional autonomy in a way that will avoid economic chaos. In a recent article outlining the history of decentralisation in Indonesia, Trevor Buising states that the changes to be introduced by Law 22 "are not as great as imagined". The idea of devolving authority to regional centres has been around for a long time. Indeed, incipient movements for autonomy and regional independence were strong in the first years of after independence, but clumsy CIA support triggered the centralist policies of the Sukarno regime. (Kahin, A.R. and Kahin, G.McT., 1995. Subversion as Foreign Policy: the Secret Eisenhower and Dulles Debacle in Indonesia. The New Press, New York). 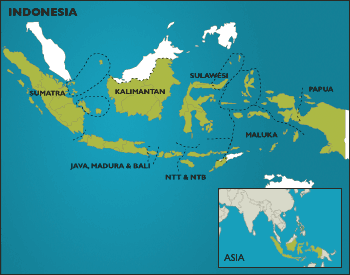 In Indonesia, regional autonomy (otonomi daerah, or "Otda") is a loose term used by government ministers and the media usually to describe transfer of authority and functions from central to regional government, as set out in Law No 22 of 1999. Because the term is used so loosely there is often confusion between devolution of authority - government by the region - and delegation of authority - government in the region. In this time of great economic, political and ecological uncertainty in Indonesia, regional autonomy is just one of the big question marks hanging over the country's future. It is a particularly complex issue because it concerns much more than the devolution of authority from Jakarta to regional level.